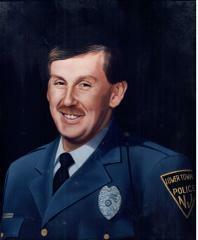 On Monday, February 18, 2019, the Lower Township Police Department will commemorate the 25th year anniversary of fallen comrade, Officer David C. Douglass, Sr., who was killed in the line of duty on February 18, 1994, after exchanging gunfire with a suspect who had just burglarized a home and then set it on fire. Officer Douglass was dispatched to a suspicious person call in the area of North Cape May. As he pursued a burglary suspect on foot, the suspect turned and shot him. Officer Douglass was able to return fire, striking the suspect in the hand and was able to make it back to his patrol car to call for assistance, but did not survive the attack. Following an intensive investigation, Lower Township Police, along with several other assisting agencies, arrested the actor in New York City in April 1994. There will be a Flag Raising Ceremony held in Douglass’s honor, at the Townbank Fire Department, (224 Townbank Road, North Cape May, NJ 08204) at 10:00 am on Monday Morning, followed by light refreshments inside the firehouse. The flags at Township Hall and the Police Department will also be flown at half-staff and a memorial wreath will be placed near the flagpole at the Townbank Fire House in honor of Douglass. There will also be a brief ceremony later that evening at approximately 7:15 p.m., at the grave site, located at the Cold Spring Presbyterian Church, (780 Seashore Rd, Cape May, NJ 08204). This ceremony will correspond with the time Officer Douglass responded to his last call. Dispatch will transmit Officer Douglass’s End of Watch broadcast for Lower Township Police Department and all fire sirens in the township will be activated in memory of Douglass, who was also a Townbank Firefighter. The public is welcome to attend these events.